HI! I am Sherrie. I am a mother of 4; 3 boys and a sweet baby girl. I became a doula in 2009 after the birth of my first son. I went into pregnancy thinking everyone has medical free birth unless there was a problem. Boy was I wrong I had no idea that epidurals and interventions were available to anyone. 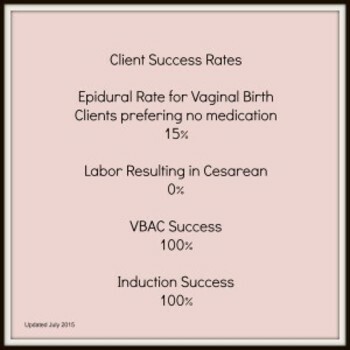 I began to research everything and discovered I had a passion for helping moms achieve the birth THEY wanted. Shortly after I began blogging at Intentional Motherhood, where I hoped to encourage and support woman in being present in the everyday. In 2014 I decided to become SBD (StillBirthday) certified. Even in a loss you are still a mom and I believe that you and your baby deserve to a protected space to find joy in each other in the midst of an otherwise difficult season. In 2015 I decided I wanted to go beyond just support during delivery and help moms throughout their pregnancy and even into Postpartum. I am currently becoming certified through CAPPA as a ChildBirth Educator and have started my own course called Intentional Birthing. In August of 2014 I will complete my Lactation Educator Certification through UCSD. 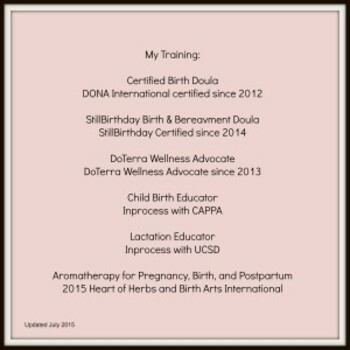 And July of 2015 I became trained in Aromatherapy for Pregnancy, Birth, and Postpartum By Demetria Clark of Heart of Herbs and Birth Arts International.